Recently renovated by Martha O’Hara Interiors (previously featured here, here, here & here), the dark and foreboding interior inside this Spanish Colonial home overshadowed its charming architectural features. 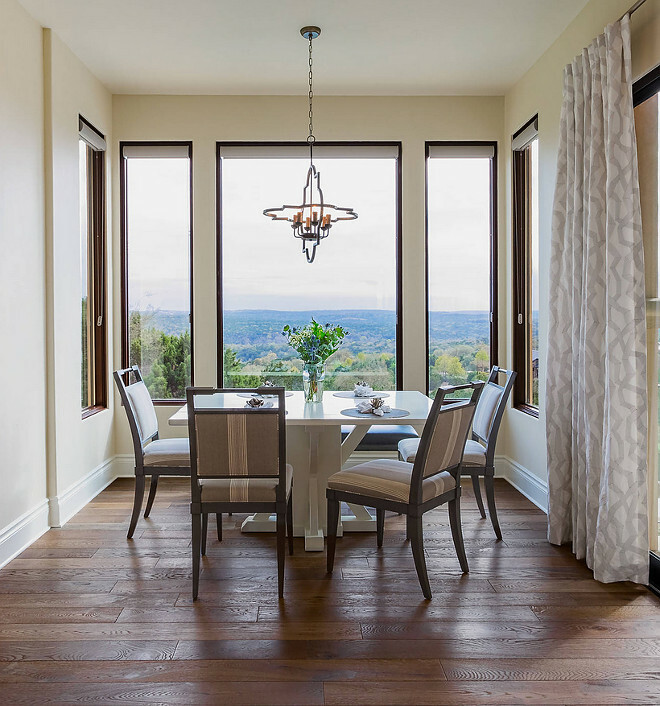 The home didn’t take advantage of the beautiful hill views nor represent its young owners, who were looking for furnishings and selections that would add lots of glamour to the living room, kitchen and dining spaces. 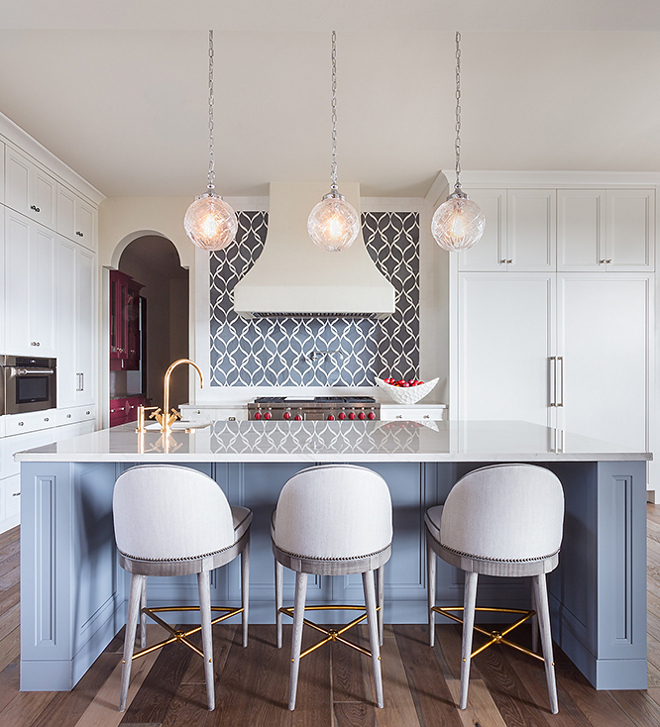 With two little girls at home, and a stylish mom with an admitted high heel obsession, the clients wanted every specification to be a WOW factor without feeling like they had to walk on egg shells. Pretty and durable was mom’s “mantra” that the designer happily ran with! High impact selections were key to the design. 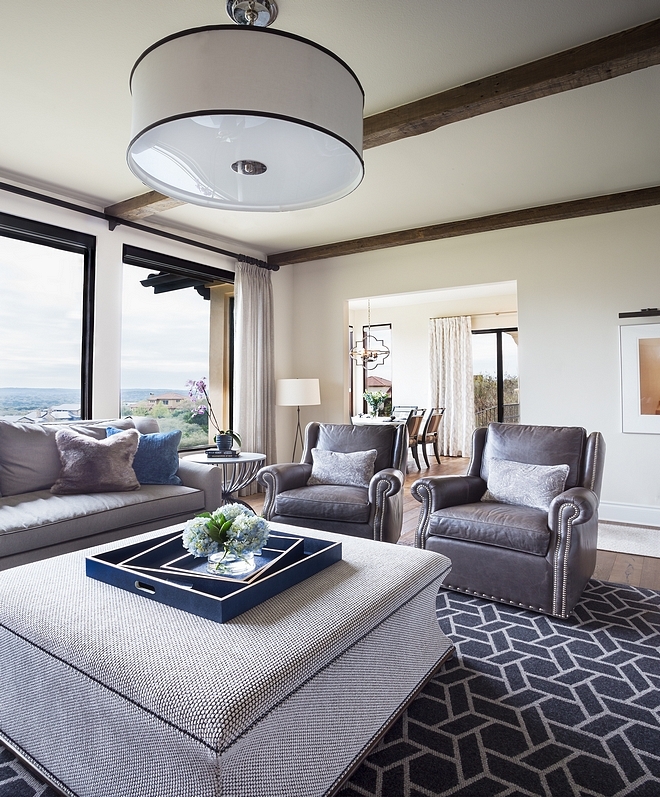 They often mixed formal and informal statement pieces to achieve the client ’s overall aesthetic: they wanted the ultimate family home that was all about high fashion AND high function. 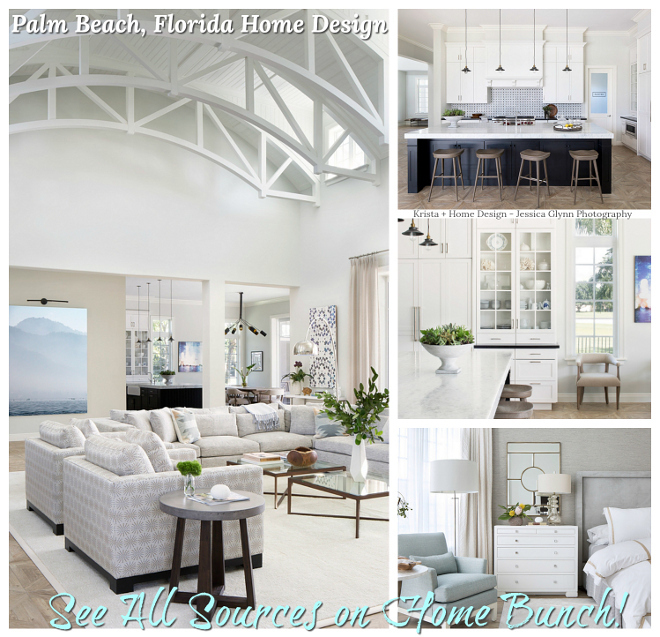 The color scheme brings a fresh feel and balances the traditional architectural details this home features. All the pillows are custom-made, one with Romo fabric and the other with Duralee fabric. 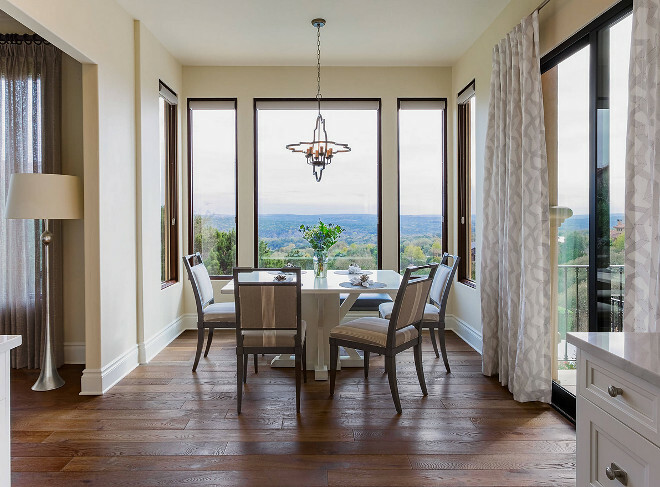 The chandelier is a 10-light chandelier in a polished nickel finish by Elk. The house used to feel “heavy” and outdated. New paint, new flooring and a few other changes made this entire space feel more current and bright. The paint color throughout the main floor is custom, Sherwin Williams 50/50 Mix (Neutral Ground SW7568/ Natural Tan SW7567). 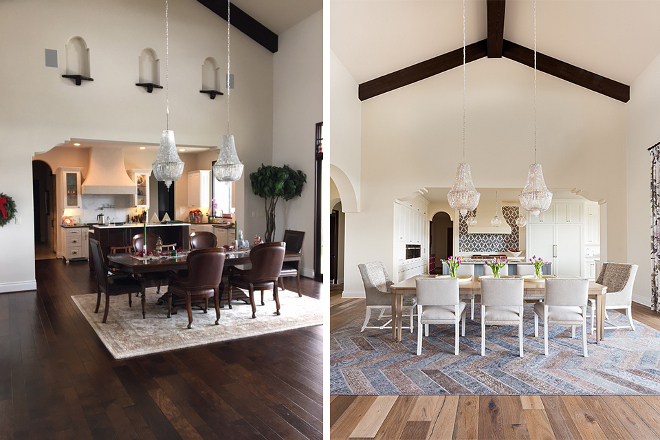 Similar Chandeliers: here, here & here. 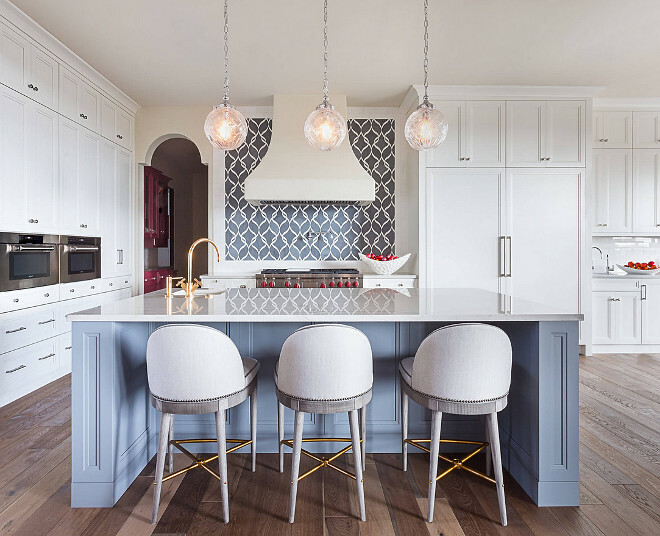 Dining Chairs: Head Chairs: Artis Shingle accent fabric by Romo and Newton Side Chairs by Vanguard. Dining table is by Hickory Chair. Window Treatment: Shanghai Garden Fabric by Designers Guild. Rug is a Custom Fay + Belle Rug. 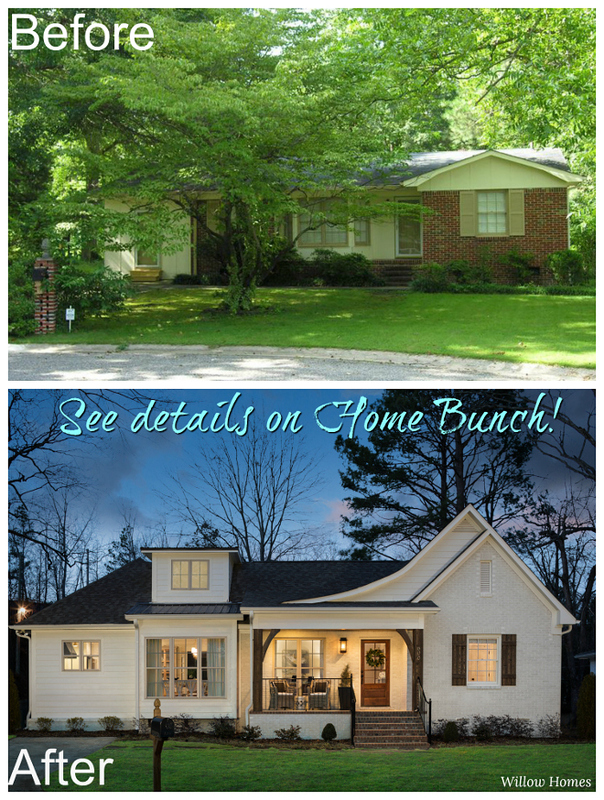 The kitchen was completely renovated and now features custom cabinetry. Perimeter and island features Quartzite with bevel square edge countertops. Kitchen Backsplash: Custom marble ribbon backsplash cut with a waterjet – similar here (white). This color is a match to Sherwin Williams’ Dove Tail. It’s very similar to Aleutian by Sherwin Williams. The kitchen cabinetry was done in Sherwin Williams Eider White SW7014. 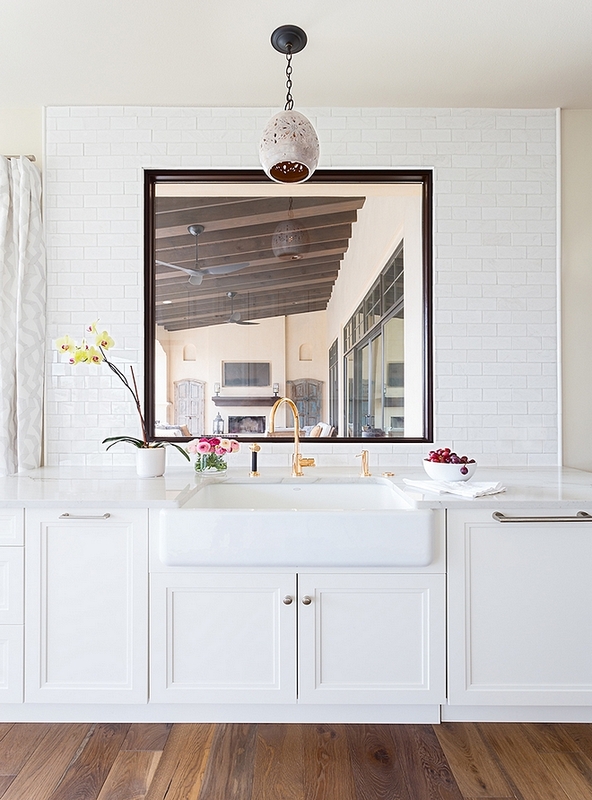 The designer mixed chrome hardware with rose gold kitchen faucets. Similar Hardware: Appliance Pulls, Knobs, Pulls. White Brick: Natural Stone Thassos Honed-Straight. Pendant: Currey & Co. Platz Pendant. The flooring is a wide European Oak Flooring – similar here. The family room is stylish, comfortable and the color palette is very forgiving; which is perfect for homes with small kids. Lighting is a Visual Comfort Drum Light Fixture. Rug is custom-made from carpet. Ottoman: Custom-made with Designers Guild fabric – Brescia – and black pearl nailhead. 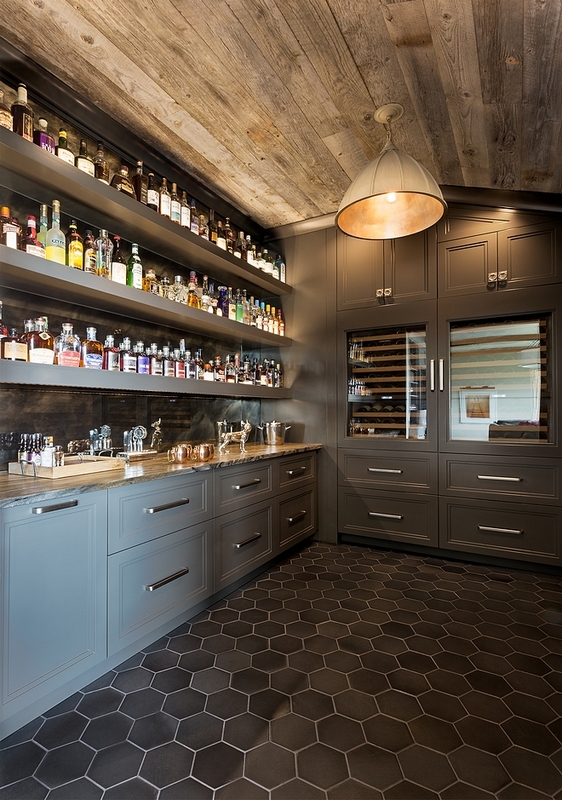 Reclaimed shiplap brings a very rustic feel to this grey bar. 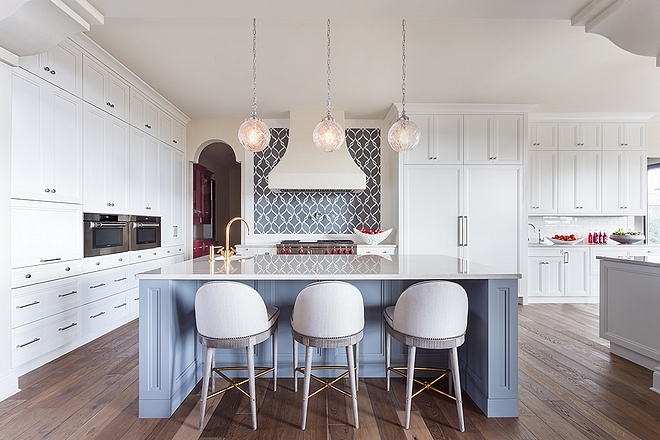 Cabinets are painted in a similar to Benjamin Moore HC-168 Chelsea Gray. Bar Countertop: Quartzite – Spicewood with chiseled edge. Pendant Lighting: Currey and Company. 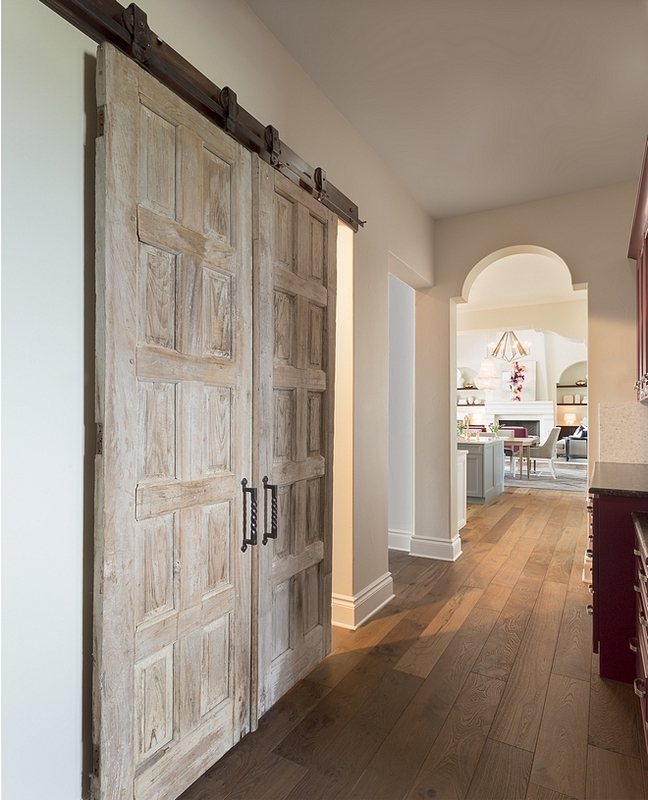 Vintage doors were hung as barn doors and add some patina to this home. The cabinet on the left is painted in Sherwin Williams Fabulous Grape SW 6293. Trim paint color is Sherwin Williams Dovetail. What a charming master bedroom! Did you notice the view? 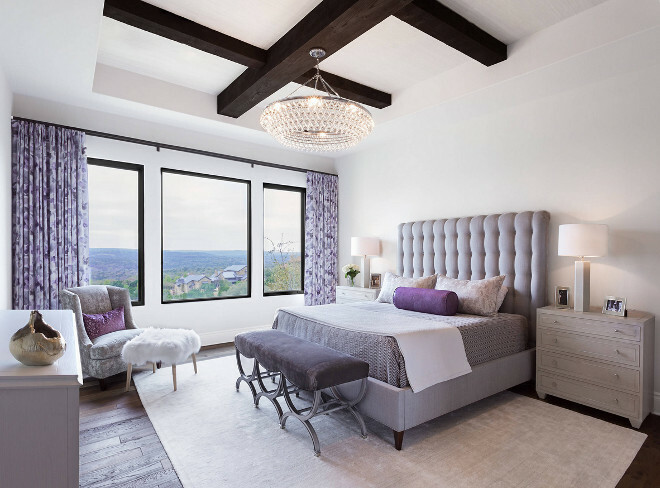 This bedroom feels feminine and elegant. The custom Vanguard Bench is available through the designer. Draperies are custom with a Romo Ashdown Cinder fabric. Chair: Hickory Chair- similar here, here & here (neutral). Paint color is Sherwin Williams SW 7015 Repose Gray. Chandelier can be found here (as above – 8-light chandelier) and here (slightly smaller – 6-light chandelier).